Four pure silver collectible coins, beautifully colored with characters from a timeless tale. Lewis Carroll's famous Alice in Wonderland is celebrated in a gorgeous pure silver coin set from the New Zealand Mint. Four of the most famous and fantastic characters are immortalized on these 1 oz silver coins, which feature Alice, the Cheshire Cat, the Mad Hatter and March Hare, and the Queen of Hearts. The original Alice in Wonderland book was written in 1865. It has been turned into numerous films, with the most wellknown and beloved version released by Disney on 26 July 1951. In the story, Alice chases a White Rabbit through a keyhole into the topsy-turvy world of Wonderland. The world gets “curiouser and curiouser” as her adventure goes on! She meets all kinds of characters including the Caterpillar, the Cheshire Cat, Tweedledee and Tweedledum, celebrates an 'unbirthday' with the Mad Hatter and the March Hare, and has a final showdown with the Queen of Hearts and her army of playing cards. The New Zealand Mint celebrates the timeless story of Alice in Wonderland, in partnership with Disney. The 1 oz Silver Coin Set features 4 pure silver coins, each displaying a favorite character from the Disney classic film. For example, the Cheshire Cat, with his infamous grin smiles down from a tree branch on one of these unique silver collectible coins, while the Mad Hatter proudly displays his pocket watch on another silver coin. The obverse side of each coin is stamped with the purity and weight of the silver coin, as well as the Disney trademark. The reverse side of each coin features the effigy of Her Majesty Queen Elizabeth, and is stamped with the 2018 year of issue and the $2 face value of the coin. The beautiful story-book style packaging has gold colored skirting and a purple velvet interior, while inside the front cover, the Certificate of Authenticity is shaped in the silhouette of Alice, and is decoratively colored. The colorful art work, clever theme and select engraving on these pure silver coins makes them stand out from rest of your coin collection. Do you know someone who loves Disney films and Disney animation? This silver coin collection would be a perfect birthday present or Christmas gift for an Alice in Wonderland fan. Are you looking for a gift for a baby shower or a book lover? These Alice in Wonderland silver coins will appeal to collectors and movie fans alike. Produced by the New Zealand Mint with a mintage of only 10,000 coins worldwide, the 4 x 1 oz Silver Coin Set - Alice in Wonderland won’t be on the shelves for long. Get yours today! Kitco carries many other precious metals Collectibles, and many of them are great Gift Ideas! 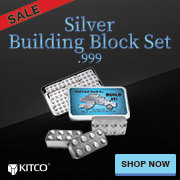 If you prefer to invest in bullion, Kitco has a wide selection of silver bars and coins, as well as gold coins and bars. Don’t forget to check out our special Deals, which are regularly changing. Bookmark our store so you’re always in the know!